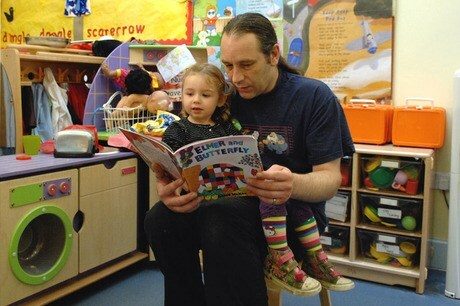 SCHOOLS, NURSERIES AND FAMILY SETTINGS ACROSS ENGLAND WILL INVITE FATHERS TO JOIN THEM TO READ STORIES NEXT WEEK IN THE RUN-UP TO FATHER’S DAY ON 15 JUNE. Fathers’ Story Week, run by the Fatherhood Institute, provides fathers and practitioners with free online resources to use as part of events to encourage better paternal engagement in children’s learning. Fathers can sign up online to participate in the project, which will give them access to facts and tips on reading with children, reports on related topics, such as reading with boys, reading lists of books featuring positive father characters, and advice for improving their own reading. ← THE DEPARTMENT FOR EDUCATION HAS MADE A U-TURN OVER ITS DECISION NOT TO PUBLISH THE RESULTS OF A KEY EARLY YEARS CONSULTATION, WHICH INCLUDED PLANS TO RAISE CHILD: ADULT RATIOS IN EARLY YEARS SETTINGS, FOLLOWING AN APPEAL BY THE UNION UNISON, NURSERY WORLD CAN EXCLUSIVELY REVEAL.